IGLO is a Gimp script. Script merges multiple images to another one with grid layout. You can use it for printing multiple photos on single paper, creating posters, wallpaper, CD/DVD covers, etc. You can duplicate images in final grid to print visit-card, etc. Script uses as many as possible opened images according defined grid cell count. Size of grid cell, count of grid cell, count of rows and columns are calculated automatically, or defined by user settings. Download and unpack (untar) archive - on MS Windows you can use 7zip, TotalCommander, etc. 2018-08-18 20:46:56 Pedro - Thaks for your scrips. It's very useful. You can add a margin beteen images and cut marks. Regards! 2017-08-03 20:47:58 Anders - Been looking for something like this to print frameless index photos for a long time. Thank you! 2017-02-12 17:08:12 Kamil - Hi Ronald, unfortunately GIMP doesn't provide script-fu development tools to make plug and play functionality. 2016-08-08 22:25:16 Kamil - Hi Rich, thank you for the suggestion. 2016-08-04 10:23:11 rich - Download is a .tar archive. Ok for me as a linux user but really would be better as a zip for all platforms. The tar is actually larger than the script - save some bandwidth use a zip. 2016-05-03 04:01:28 Partha - Thanks for your help. 2016-05-02 21:53:25 Kamil - This folder is inside your home folder. Beware of folder name - it starts with dot, therefore it is hidden on Linux! 2016-05-02 18:20:10 Partha - Please tell me inside which folder I will found /.gimp-2.8/ I am new to Linux. 2016-05-02 16:25:13 Partha - How to add this script in Ubuntu? 2016-03-23 05:07:16 Benny - Hi Kamil! The Script is very straightforward. I love it. Works like a charm! Feature request: Save parameters! I do the same thing on similar images, but not always in the same GIMP session. When I close and open GIMP again, I have to adjust the parameters in the script. Would be cool if I could just save the parameters in a file and load it. This way, we could have multiple files with various standard parameters. ~Cheers! 2016-02-22 22:13:26 Kamil - Fixed - download new version 1.8, please. 2016-02-21 20:35:25 Kamil - I have reproduced the error. All you guys were right! I'm sorry. 2016-01-06 13:07:02 Thomas - I confirm the same problem as described by Myron, Adrien, Michael as tested using IGLO 1.7 with GIMP 2.8.10 on Win7 as well as on Linux Mint. For me the reported error message shows reproducibly when the "Repeat image(s) x-times" setting is > 1. 2015-12-15 22:09:37 Kamil - Hi Tracey, Michael and Adrien - My apologies for late answer! Regarding your problem - I don't understand exactly settings which cause the error. Especially "Canvas width/height". In IGLO script is no setting with this name (see picture above). Do you mean "Image place width/height"? This setting defines size of single place for image on the paper. Therefore if you want repeat some image X-times on paper, image place must be 4x times smaller then paper size. But you don't need to set "Image place size" - let it be zeroed. Please can you send me email (below on this page) with screenshot of your settings? 2015-04-26 20:46:43 Kamil - Heidi - Thank you for your feedback, but I tested the behavior with two square pictures and aspect ratio were kept. Please can you send me your images? 2015-04-07 19:16:18 ajantaju - Forgot to mention, Windows 7, Processor AMD FX-8350. 2014-09-14 12:47:23 Jan Vandewoestijne - Thanks for the script! Works like a charm! 2014-07-14 14:13:48 Amnon - Thanks for a great tool! 2014-06-14 23:33:23 san - Thanks a lot for making (and maintaining!) this very useful script! 2014-06-02 21:21:05 Kamil - Hi Matt! Thanks a lot for your feedback :-D! I'm sorry for that the script ignores inches. I didn't expect expansion to other side of ocean... :-D Unfortunatelly I'm very busy now so although the change is small I can't promise when it will be done. 2014-06-01 14:16:33 Matt Caron - Excellent script! It's especially nice because I (a Linux junkie) and my wife (a Mac head) can both use it! One request, however - we're stupid Americans, and our whole film industry is based on paper sizes established 100 years ago. So, if we're trying to do a US Letter cut up to 3" x 5" sizes (so they fit in frames) we have to do the in -> mm conversion manually. Would it be possible to add a "Size Units" option for inches, so that the Image Place Width and Image Place Height can be specified in inches? It would be most convenient! Thanks again! 2014-05-21 09:08:33 Kamil - Hi Meg, thank you for your positive feedback! Unfortunatelly it's not possible to set margines in script settings now. But there exists a workaround. You can set result "paper" (meaning result image) size manualy by "Paper width" and "Paper height" control. So it's possible to set smaller result image then real paper and center resulting image on paper in printing settings. 2014-05-21 03:43:15 Meg - Great script, thank you -- exactly what I was looking for. One problem/question though -- is it possible to set up printing margins? Or otherwise influence how close the images are to the edge of the page? At the moment the images are being set right at the edge of the A4 page, which means they won't print. (Need it to print actual size) Thanks! 2014-04-30 07:56:20 Kamil - Hi Tony - You have to download the script and place it into folder ~/.gimp-2.8/scripts, or [gimphome]/share/gimp/2.0/scripts/. Then restart Gimp and you will find new menu item in Tools menu. 2014-04-30 07:52:41 Kamil - Hi ben, this script only calls Gimp functions. All operations with pricture are done by Gimp. Try to do it manually in Gimp. 2014-04-23 18:30:53 ben - Anything above 300 DPI -kills- my machine (8gb i5), but thanks for your efforts! 2014-04-15 05:45:34 David - Immensely helpful, saved me a lot of time. Thanks for writing this! 2014-02-23 10:51:01 salahzar stenvaag - Very nice plugin, just two questions: 1. Is it possible having the images centered on each grid slot (or other alignment like top, left, right, bottom,) 2. Is it possible to define something like 2x2 and producing a stream of output collages each with 4 images inside? I'd love to use this as an alternative to printers that are able to combine multiple pages from word say in images each having a 2x2 or similar structure. If you want, you can reply at salahzar@gmail.com. I usually do teach gimp, blender and scripting in Italian. 2013-09-05 22:34:36 CJ Cornell - what does "open your images for printing" mean ... never heard this phrase in Gimp. Can't get the plugin to work properly otherwise. 2013-06-15 18:29:47 - to Valerie: Unfortunately it's no possible to change orientation of resulting image by script now. You have to do it by Gimp manually. 2013-06-09 23:23:31 weirdtalk - very useful script. Worked great for making a diy picture walk through. My only complaint is that it inserted the pictures in the reverse order (right to left, bottom to top). I got arround it by opening the photos in reverse but it would be nice to have an option for order or change left-right, top down to the default Using kubuntu + dolphin + gimp 2.8 as my workflow. 2013-06-05 18:19:57 Valerie - Could you tell me how to switch the orientation to landscape? 2013-05-24 11:11:56 Kamil - Unfortunatelly it's impossible to arrange gui elements to several columns in fu-script. Therefore is the form so long. 2013-05-13 04:05:04 Chawalit Anutarawanichkul - It is really useful, I had trying to find this for a long time. Thank so much. 2013-03-10 16:54:46 Ananya - Great tool! Thanks man! 2013-02-07 07:57:28 Kamil - Unfortunately it's not possible to make multiple pages now. 2013-02-06 16:02:40 dhrumil - Can i make multiple pages if the grid is too small for the number of photos. I want a 5 x 5 grid but i have like 200 photos. 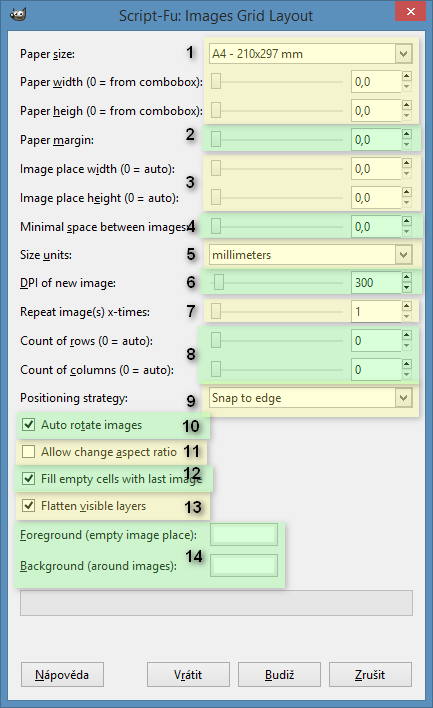 2013-01-15 12:24:06 Kamil - William: you can set paper size manually just below combobox with predefined sizes. You can set size till A1 now. I'll prepare update of the script with bigger predefined sizes as you mentioned. 2012-11-02 13:07:10 Tim - Excellent script this - the final link in the chain to enable me finally to use Linux for all my photographic work. 2012-08-31 06:27:23 Kamil - to bgold2007: There are instructions on top of this page. See section "Install and use". 2012-08-31 06:24:37 Kamil - to nooj: Unfortunately it's not possible yet. You have to open images in Gimp and then run the script. 2012-08-31 02:38:59 bgold2007@gmail.com - I am a Win7 user dual booting to Ubuntu. You provide NO instructions of how to "install" or save the script. Double clocking d/ls a tarball which becomes a scm file which I have no idea where to save to, which wants to update (or be updated?) which I close and select "save changes" but then when I try same with original file I get red error message "cannot find..." The dearth of a program of simple competence for Linux like the free, included windows photo viewer, with simple grids , still exists. 2012-08-20 21:10:39 Germanunkol - Exactly what I needed! Thanks a lot! 2012-06-08 19:24:58 Florent - Thank you very much for your script, it works like a charm and it's very helpful! A nice feature would be to have the option of printing the cutting grid, that would allow easy cutting when you are printing duplicates of the same image. 2012-05-09 07:31:44 Kamil - I just installed Gimp 2.8 on Windows 7 Ultimate and IGLO script works to me without any problems. Check you have IGLO script placed in to folder ".gimp-2.8/scripts" in your profile (home folder). Then run The Gimp, open your images (it is neccesary) and run script from menu Tools/Images Grid Layout. 2012-05-05 21:46:39 Ambimom - FYI, the script is still in the share/script location, but it does not appear in "Tools" in 2.8. I am using Windows 7/64 bit. 2012-05-05 21:43:45 Ambimom - This has been amazing for me!!! Works great, except the script doesn't work in Gimp 2.8. Are you going to update it? Please, please, please. I really need this one. 2012-04-04 04:53:56 alzurzin - I thank you sincerely. It works great with gimp 2.7 on ubuntu. I searched for a year to find such a script, and am very happy to be able to print multiple photos on a single page. I get a many error messages, though, when I execute the script, but the end result seems fine and I can print it. 2012-04-04 00:12:04 Anne - Hi, I used to love your script! However, it seems it does not work any more since I upgraded to Windows7 and gimp 2.6.11. Is this possible? I do not change any of the pre-set values, and this is the error message which I receive: "Procedure execution of gimp-layer-new failed on invalid input arguments: Procedure �gimp-layer-new� has been called with �0� for argument�width� (Nr. 2, Typ GimpInt32). This is an invalid value." The script does not run at all. If I enter anything apart from "0" for Image place width in step 2, a new image is created but looks totally messed up. Looking forward to hear from you! 2012-03-15 13:10:16 Kamil - I'm really sorry, but I'm not Apple user and I don't know the system. Please check Gimp documentation. Try to find, where is scripts" folder located and put the script there. 2011-10-23 13:11:38 John - A great tool. Just what I had been looking for. Many thanks. 2011-10-15 22:14:49 Alex - Thank you very much, this is a brilliant and ver useful scripts ! Thanks for sharing and best ! 2011-07-24 19:55:17 Steve - Thanks for considering this Kamil. My idea is to have something similar to Photoshop Contact sheet which allows choice of resolution, image size, number of columns and number of rows per page. So you can have lots of small images or only a few larger images on each page. The caption would be the file name under each photo. I use it to add an appendix of photos to my reports. 2011-07-21 07:32:31 kamil - Hi Steve, unfortunatelly the script can't devide photos to multiple pages now. It's not supported feature. I can do it in future development, but I'm realy busy now. So I can't promise to you when it will be finished. Situation with "file name caption" is same. What is your idea? Where should be the caption? Plz. write me an e-mail. Thank you. 2011-07-18 19:49:13 Steve - Installed OK. I am trying to make photos fit 1 column, 2 photos per page across as many pages as necessary, but I can only get them all appearing on one page. Am I missing something? Also - is there a way to get the .JPG file name to appear as a caption? 2011-06-01 15:48:32 oliver - Many thanks � that was exactly the tool I was looking for! Simple but VERY useful. 2011-05-23 07:44:07 kamil - Thank you for an caution! I'll try to fix it asap. 2011-01-23 16:03:14 Kamil - Hi Michael! Thank you for your feedback. The problem is in settings. You can set exact size of each grid field (place) - see parameter 2 and 3. Then your business cards will not be resized. 2010-11-09 13:24:24 Kamil - to Frank: This would be a significant change in the concept of the IGLO. Script-Fu and its GUI isn't good to solve such a problem well. Therefore I do not provide this functionality in near future. Sorry. 2010-11-09 13:15:28 FB Ronnie - Works like a charm I've just printed myself some business cards. Thanks a lot! 2010-09-20 05:56:09 Kamil - to unknown below: It would be nice, but Gimp authors don't want to add more plugins into the basic install. 2010-09-20 05:53:31 Kamil - to Wolfgang: thanks for tips! 2010-09-17 11:37:30 - Plugin is really useful! Any chance of this going into the default gimp install? 2010-08-09 13:25:02 Mukul Dube - Looks useful. Thank you. Must examine it carefully when I have the time -- or the need. 2010-07-26 18:49:18 Wolfgang Oertl - Works quite well to print a half A3 size image to one A3 twice. I miss an option to avoid scaling and to space the images evenly, or to add a certain margin to the resulting page. But anyway a big help, thanks! 2010-04-14 19:21:07 Kamil - ???????? ?? ???????? ? ???????. ???????: ? ????? ???? ????. ? ?? ????? ?, ??? ?? ?????? ???? ??????? ??????? ???? ? ????????? ?????. ? ???? ???? ????? ? ??????? Google Translate. ? ????????? Iglo ??? ???? ??????? ?, ??????? ? ??????? ? ???????. ? Script-Fu ????? ?????? ?????????????????. ??? ????? ????? ?, ???????? ???????. ??????? ???????????, ? Python. 2010-03-16 09:30:58 Kamil - ??????? ?? ??? ?????! :-D ? ??? ?, ??? ?????? ????????. 2010-03-16 06:20:24 Ljubava - ??????,??????? ??????? ?? ??????! ? ?????? ????????? ???????????! 2010-02-13 14:51:28 Kamil - Thank you Peter. Nice work! If you agree, I'll add the link to this page. 2010-01-21 13:09:08 Kamil - I don't understand exactly where is the problem. Please send me e-mail with example to my address (on bottom of page). 2010-01-21 09:57:43 Alexander - 1.2 (7. 7. 2009) with gimp 2.6.6 (Linux). I try multiple my 35x45mm (it's "printing image size" in Gimp) photo on A4 paper, but IGLO stretches this photos to A4 width. Is't mistake? 2010-01-09 10:33:14 Kamil - I'm sorry that this is not in the install procedure. Downloaded TAR file must be be unpacked (untar) into that directory. For "untar" on MS Windows you can use 7zip, TotalCommander etc. I will fix instructions. 2010-01-09 03:05:13 Jon - I've moved the script into /share/gimp/2.0/scripts/ and opened images but there is still nothing in the tools menu. I noticed all the other scripts i have are .scm files where as this is a .tar Am i in the wrong folder? 2010-01-08 12:55:34 Charlie - I installed your script in gimp 2.6.8 but i can't seem to find it in any of the menus when i open gimp. I am using windows vista. 2010-01-03 15:05:36 Kamil - Very sorry, I had an error in the script. Now everything is in order. 2010-01-02 20:03:33 Tomas - Hi Kamil When i try to download IGLO i just get a picture saying Rails, am i doing somthing wrong, or is it some problem with the download? 2009-12-11 16:05:29 Kamil - to Marcel - I'm sorry, but I misunderstood your problem. This behavior is by design. Script make resizing the input image (with the maintenance aspect ratio) so as to fit into boxes in the grid. 2009-12-04 19:33:10 DavidG - I used your script to make a 12x15 A3 grid of baby photos for the first 6 months with our son for my wife. Google Picassa has identified the face shots, and your script did the layout. The result is awesome, thanks for your effort and making it available. 2009-11-25 07:55:00 Kamil - Thank's for bug report. I'll fix it ASAP. 2009-11-25 05:54:21 Marcel - Hi.. I've been trying this for a long time but it does not work. Try choosing a US letter size, 8.5x11" and print three 4x6" images on it. IGLO will place two images side by side, and the third image also in portrait mode below it. That should be impossible: 6" + 6" = 12" and the max. paper size is only 11".